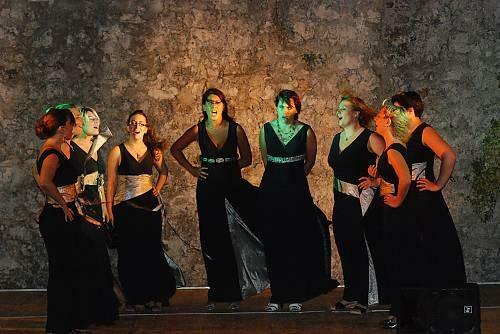 Klapa singing is a multipart singing tradition of the southern Croatian regions of Dalmatia. Multipart singing, a capella homophonic singing, oral tradition and simple music making are its main features. The leader of each singing group is the first tenor, followed by several tenori, baritoni and basi voices. During performances, the singers stand in a tight semicircle. The first tenor starts the singing and is followed by the others. The main aim is to achieve the best possible blend of voices. Technically, klapa singers express their mood by means of open guttural, nasal sotto voce and falsetto singing, usually in high-pitched tessitura. Another feature is the ability to sing freely, without the help of notation. Topics of klapa songs usually deal with love, life situations, and the environment in which they live. Bearers and practitioners are skilled amateurs who inherit the tradition from their predecessors. Authors and personalities: Darije Hrovatin, director. Production: Euroval, producer ; Croatia. Ministry of Culture, producer.